Press Release (ePRNews.com) - Dallas, TX - Jan 12, 2018 - According to a survey conducted by Training Industry in 2016, 75 percent of employees invested their own money in career development, and 69 percent of workers asked a boss or mentor for direction to learn something new — a clear indication of a workforce eager to learn. As part of their continuous efforts to improve the ways employees can grow and develop, leading organizations, including the National Basketball Association, The Goodyear Tire & Rubber Company and others, are sending their top learning executives to the Chief Learning Officer Exchange in Austin, Texas, February 11-13. At the three-day event, attendees will discuss the latest in employee learning research, how learning can influence culture change and the introduction of “always-on” learning initiatives. On the opening day of the Exchange, Michael Kennedy, The NBA’s Associate Vice President of Talent and Learning, will deliver a session discussing how learning and development can power culture change, and how the NBA initiated cultural transformation within the league office by embracing innovation, collaboration and strategic agility. On day three of the event, Travis Brewer, Goodyear’s Director of Global Learning and Development, will lead a panel discussion revolving around the evolution of the role of learning and development. Attendees will learn how to develop novel approaches to blended learning, build a growth mindset and maximize technology in employee learning initiatives. Other executive-led speaking session and roundtable discussion topics at the Exchange include diversity and inclusion training, the power of providing feedback and organizational behavior management. 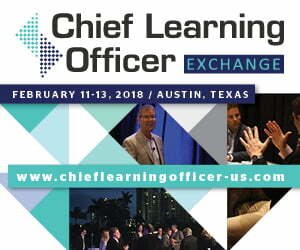 The 2018 Chief Learning Officer Exchange is an invitation-only event where top learning and development executives come together to see how some of the world’s leading companies continue to evolve their learning and development programs using cutting-edge technologies, evolving practices and the latest research. IQPC Exchange is a division of the International Quality & Productivity Center (IQPC). A global event management company founded in 1989, IQPC leverages proven, data-backed best practices to produce an unrivaled portfolio of problem-solving conferences, currently delivering approximately 2,000 events across the globe each year.